(CNS): The coral reefs of the Cayman Islands need to be healthier, with more fish and better coral protection, to improve their resilience so that they can withstand new threats, such as climate change, disease and population increase, scientists from the Department of Environment explained at the first of a series of meetings Monday night on Cayman Brac to educate the public on the state of the Cayman Islands Marine Protection programme and to explain why it needs to be continued and enhanced. The parks were created 25 years ago, but while successful, they need to be extended, which might be achieved by widening the boundaries along the coastline, but could also be done by extending the contours of the parks out from the shoreline. While the DoE and its partners from the University of Bangor in Wales and the US Nature Conservancy are working hard to gather hard scientific data to guide the decision making on the Marine Parks, they will also be asking for input from the public about to shape the vital protection of the marine environment in the future. The programme will only work if it has the support of the people, said Dr John Turner from Bangor University. DoE Director Gina Ebanks-Petrie explained that the parks were initially established 25 years ago because of concerns over the rapid development of the islands, as well as the over fishing, especially of conch and lobster. However, there are now new threats to consider, mostly associated with climate change, such as a warming ocean, increases in sea surface temperature, increase in storm activity, ocean acidification and sea level rise. All it takes for coral bleaching, which has a devastating effect onthe reefs, is a rise in temperature of 1% for an extended period of time, she said. A stressed reef is more vulnerable to disease, which can kill or weaken a reef structure. In addition, the population of the Cayman Islands has more than doubled, she said. With a weakened reef, there are less reef fish and so less fish to eat the algae, which then out-competes corals on the reef, creating a vicious circle of decline. Dr Turner noted that Cayman still had a very rich and vibrant marine environment which had benefitted form the 25 years of protection and was known around the world as one of the best and most protected marine habitats. Compared to protected areas in most other countries, it is real and it is enforced, with good signage, legislation maps and marker buoys, he said. While there are various zones, including environmental, no dive, wildlife interaction and replenishment zones, the no-take fishing zone covers only around 17% of Cayman’s shelf. Ideally this should be around 50%, Dr Turner said. Partially funded by the UK Department of Environment’s Darwin Project, the scientists are currently reviewing the Marine Park system to see how it needs to be changed or enhanced. The gathering of data to assess the reef health is headed by Croy McCoy of the DoE, whose work on the project will also form the basis of his PhD. Once the scientific data is gathered, this, together with information collected from interviews, will be plugged into a sophisticated computer programme, which will produce various options as to the way forward. These options will then be presented to the public to find the best solution for Cayman. The results of the reef surveys so far give strong indication that the Marine Parks are working, noted DoE Assistant Director Tim Austin, and that there is significantly more coral cover and less macro algae inside the parks than outside – at least around Grand Cayman and Little Cayman. 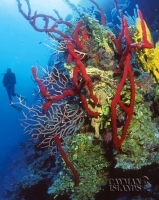 Results from Cayman Brac are less clear, the scientists noted. In fact, in this and other comparisons, such as the extent of disease and bleaching, and recruitment of juvenile corals, results from the Brac reefs generally showed the opposite of what was anticipated, while data from the two other Cayman Islands showed the expected results in each case. Ebanks-Petrie said a possible explanation was that the parks around the Brac are not large enough and also that perhaps they were not in the right areas. The issue of lionfish was of great concern to Brac residents, who thought that dealing with the problem should be more aggressive and more people, even tourists, should be recruited to cull the fish. However, while the DoE director emphasized that the lionfish were a major concern to the department, she said that other issues, such as overfishing, were just as important but their capacity to deal with them was greater than the lionfish problem. “Some scientists are even saying that it is a waste of time applying resources to this problem,” she said, noting that the DoE did not accept this theory but said the DoE had to keep all the issues in mind and to keep this one in perspective. It was also noted by a member of the public that when the Marine Parks were first launched, members of the water sports industry were told that after a period of time, some areas would be opened and others closed to fishing. When asked about the issue of sewage and chemical runoff, the DoE director said that unlike some countries in the Caribbean, there is not direct input of sewage into the ocean, “which is one good thing.” However, theislands are porous limestone and the septic tank treatment of sewage may find its way out into the ocean. She said they were not finding extensive impacts of this issue, though they were monitoring it, but noted that the solution – a central sewage system – was very expensive. As far as use of fertilizers, she said they had no legal remit to remedy this but they did try to inform and educate people about the use of chemicals and the effects. “It’s not a huge problem yet but we need to keep it on our radar. It is something we need to be concerned about but it’s not right at the top of our priority list,” she said. The next meeting will be held at the Bodden Town Civic Centre, tonight (Wednesday, 7 September), starting at 7:30 p.m. There will be a short presentation as well as time for questions and comments. Refreshments will be served. Other meetings are as follows: Monday, 12 September at Sir John A Cumber Primary School, West Bay; Tuesday, 13 September at the South Sound Civic Centre, and Thursday, 15 September at the East End Civic Centre. All meetings start at 7:30 p.m. A meeting for Little Cayman residents will be scheduled for October or November this year. For more information contact Laura Richardson at laura.richardson@gov.ky or 949-8092. For a schedule of all public meetings, go to www.gis.ky and look under Bulletins. ". . . so that they can withstand new threats, such as climate change, disease and population increase"
Sorry, not true. Cayman's marine parks were innovative (Thanks Dace Ground) and absolutely brilliant 30 years ago. The fatal flaw, however, was that supportive legislation and the necessary intelligent planning on land was neglected. Our behavior on the land (toxic runoff, deforestation) has devestated the "protected" reefs of Grand Cayman. It is also absurd to suggest that the marine park system will protect our reefs from climate change, disease and population increase. Our dept. of Env. seems to be doing all they can considering they have to toil under the leadership of politicians who know nothing and couldn't care less about the environment. But theyshouldn't sugarcoat reality and give Caymanians false hope. Our reefs are doomed. But that's OK, I suppose. After all, every single politician we elected over the last 30 years made it clear that they didn't know much if anything about conservation and were much more interested in short-term profit for themselves and the country than in any sort of sensible long-term, sustainable plan. In a very real sense, we voted for destroyed reefs and now we are getting exactly that. The full quote is "The coral reefs of the Cayman Islands need to be healthier, with more fish and better coral protection, to improve their resilience so that they can withstand new threats, such as climate change". So – how can a marine parks system help protect our reefs from climate change? There are many predictions associated with climate change (elevation of sea-surface temperature etc.) which cause severe problems for coral reefs. While there is little we can do in the short term to alter the temperature of the ocean, there are practical steps we can take to “improve… resilience” of our reefs through careful planning of marine protected areas. While high temperatures and storms have the potential to damage all corals, healthy coral has a better chance of surviving these impacts than coral which is already unhealthy – they also have a better chance of recovering afterwards and reseeding other areas. Minimizing damage to coral from manmade impacts (disturbance, anchor damage, nutrification and siltation from terrestrial run-off etc.) is one way of making sure that corals are healthier now. Reducing day-to-day impacts leads to stronger, healthier coral – coral more able to copy with the additional challenges of climate change. Coral which is already damaged and diseased has less chance. To these ends it makes sense to ensure that our marine protected areas are protecting the healthiest areas of coral, rather than unhealthy corals. Healthy reefs with a greater diversity of life will also likely have a greater potential to adapt to climate change that those with a lower diversity of species. This is because the changes associated with climate change will likely be less detrimental to some species than to others. Additionally, even within a single species, a healthy reef is likely to support a greater genetic diversity (different strains) than an impoverished reef – enabling a single species to draw upon its more varied genetic reserves and better adapt to changes in the environment. Making sure that marine protected areas are of sufficient size can contribute to their being more robust in the face of damaging influences. Small, fragmented populations have less chance to recover, because once damaged they are “gone”. In larger populations, damage to one area can be re-seeded and replenished by less effected areas. The Department of Environment is not in the habit of “sugar-coating” environmental issues. Cayman’s reefs have suffered serious damage in the past, in the present, and will face even greater challenges in the future. With intelligent, responsible and responsive management “now” we can minimize damage to the reefs of the future. The reefs which our children will enjoy will not be the same as those which our generation once enjoyed, nor the same as those we enjoy now, however, it is certainly our responsibility to make sure that they will be the best that they can be. "The reefs which our children will enjoy will not be the same as those which our generation once enjoyed, nor the same as those we enjoy now, however, it is certainly our responsibility to make sure that they will be the best that they can be." That's a great way to put it. Very well stated. I do wish you guys luck, but with UDP and PPM types running things I don't see much hope. They won't rest until they have ripped up every mangrove tree and added a few more golf courses and hotels to our tiny little island of Grand Cayman. An oil refinery will do wonders for the health of our reefs, too, I'm sure. And like it or not, if we want sustainable local waters, we must stop overfishing our reef fish. People, PLEASE learn which ones that end up on your plate ARE Reef Fish and please stop ordering them in restaurants. There should be more pressure from the public to limit the number of reef fish sold. It takes over a dozen years for a reef fish to mature and only minutes to eat. Think about it. According to our own history, we are scavengers of the sea and have done more harm in 300 years than any huge army. Fish, fish, fish,…..oops, Hey Wher'd the food go??? THE PARKS MAY WORKING ,BUT NOT IN EAST END. Every day ,or almost there is some ,or some bodies in the parks taking counch and lobsters. Every week end they are selling roast conch by the road side. The doe employees comes to the district in thier trucks, but boats. you will not catch these guys in a motorvehicle. It's easy for the poacher to dump his catch before a boat gets close. Big bucks are being spent on all the cameras around the island…….. Why not get a good long-range camera for getting proof of illegal game taking? Have a DoE agent record the greedy persons taking conch,etc. and let them try to deny THAT in court.